Rob's Idaho Perspective: Its Time to Molt! In the bird world autumn brings another major life event for many species - migration. For many this will be their first trip south following some route that has been permanently imprinted in their genes. Most are not guided by parents or even other members of their species. It is often a lonely journey of a single bird flying alone. As a raptor biologist I study migration. My masters thesis is actually focused on breeding season ecology and not migration, but my undergraduate research focused on migration and I continue to work in the area out of personal interest. I have published one paper on the subject (Miller et al. 2011) and have a second paper in the works (recently presented at the North American Ornithological Conference in Vancouver). My migration work is performed in conjunction with the Idaho Bird Observatory. I have used their 17+ years of migration data in the analyses I perform. I have also helped collect that data for the past four years banding songbirds, counting migrating raptors, and banding raptors. This fall most of my effort has been in the last category trapping and banding migrating raptors. I have spent two to three days a week siting in a blind trapping and processing these impressive migrants. The data collection serves many purposes. Banding birds helps us to understand migration routes, breeding and wintering locations, and resource use which is important for conservation purposes. Most of my analyses have been focused on the timing of migration in response to weather and climatic events. Increasingly I have been looking into the body condition of these migrants in response to climatic events which can help paint a picture of changing prey availability. It is a complex picture, but the large dataset amassed by countless volunteers over the past two decades provide convincing evidence of change. On a lighter note, one of the most impressive aspects of this data collection are the opportunities to examine individual birds up close and personal. We have been trapping raptors daily over the past month. So far we have banded over 600 raptors (143 for me personally!). The season generally starts out with us capturing primarily juvenile birds. This isn't just because they are easier to trap (they are), but in many species the juveniles migrate before the adults. There are differing hypotheses as to why this is such as adults can stay on breeding grounds longer as prey declines as they are better hunters or adults need to stay on breeding ground to molt feathers. In some species the males and females migrate at different times. This is supported by differing molt strategies between the sexes, differing migration distances between the sexes and differing prey requirements as the larger females require more food. If you are getting a sense of how complicated the study of migration can be, you are absolutely right. Now that we are hitting the peak migration season, we are starting to see and trap more adult birds. This allows closer analysis of the subtle distinctions in ages of birds. 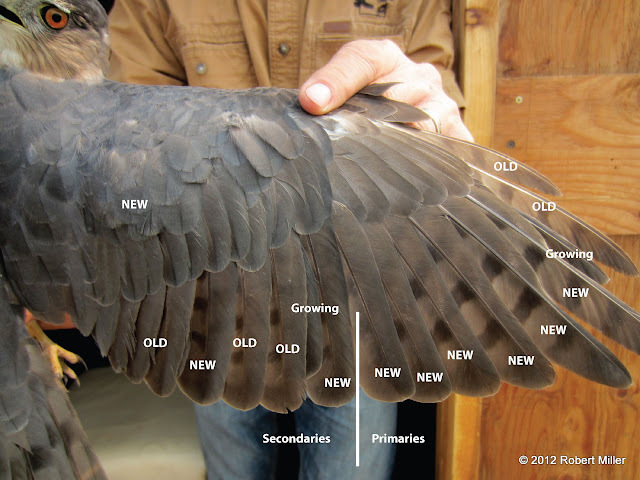 We analyze age primarily through molt patterns in the feathers. Juvenile bird have all juvenile plumage. These birds are referred to as "Hatch Year" birds. Adult birds that have retained some juvenile plumage can be safely said to be "Second Year" birds (1 year old). If an adult bird has retained (old) adult feathers then it is at least "After Second Year". If it is an adult and we cannot find any old feathers, we cannot tell if it is a Second Year, Third Year,... only that it is "After Hatch Year." However, in some of the larger birds that might not molt all of their feathers in a single year, we may be able to do better. We have recently started collecting more data which may help us more precisely age these individuals. We are now looking into the molt patterns of the primary, secondary, and tail feathers in the hope to identify patterns unique to different ages. Figure 1: Adult Cooper's Hawk. I have included a couple of photos which may help illustrate this point. The Cooper's Hawk generally molt all of their feathers every year, but there are unique patterns in how they do it. The Primary feathers are the 10 feathers (most species) at the tip of the wing that extend out from the hand of the bird. These are called flight feathers as they are strong feathers that help support the bird in flight. Secondary feathers extend back from the forearm and are also flight feathers. Whereas contour feathers are body feathers which may help smooth the air, but also provide insulation. The primary feathers are numbered starting at the break between the primaries and secondaries and extending out toward the tip of the wing. Most birds begin the annual molt by replacing P1, then P2, ... In Fig.1 you can see that this adult Cooper's Hawk has replaced P1-P5, P6 is nearly complete, P7 is only 30% complete, and P8-P10 are retained feathers not yet shed. In Fig. 2 (different bird) the pattern is nearly the same except P7 is at 70% and P8 is not visible as it is only about 10% grown. Figure 2: Adult Cooper's Hawk. The secondary feathers are counted starting at the break with the primaries and moving in toward the body. 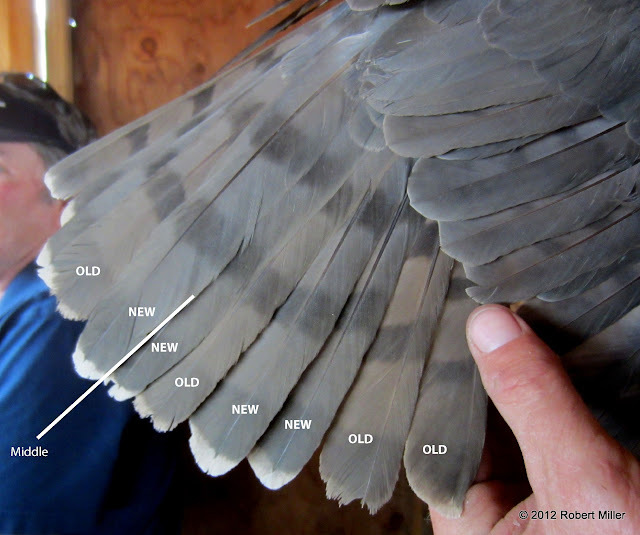 This numbering system is consistent with the general way that birds molt the secondaries. 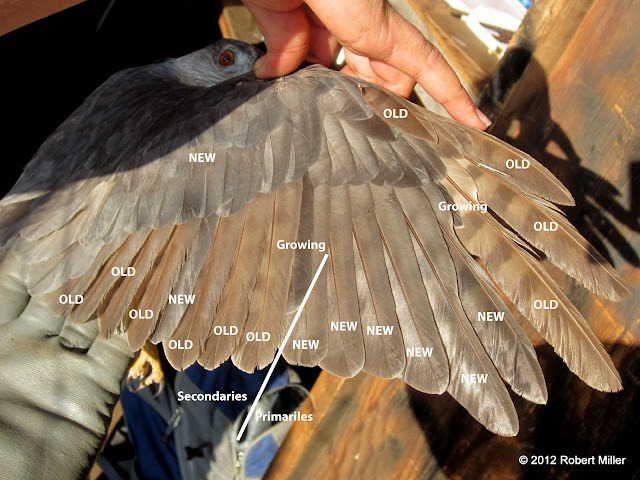 In large birds such as eagles, a second wave of molt may being at S1 before all of the previous secondaries have been replaced resulting in 3 or 4 different age feathers along the wing. In these situations more precise aging is possible. Accipiter Hawks (in North America: Sharp-shinned Hawk, Cooper's Hawk, and Northern Goshawk) exhibit a modified version of this molt strategy. They molt the primaries starting with P1 and moving toward P10. This is illustrated in both Cooper's Hawk photos. The Northern Goshawk will sometimes not complete this within a single year and a second wave will start behind the first during the next year. For the secondaries, Accipiters begin with S1 moving toward S4, but will also start with S5 moving toward S10. In Fig. 1 you can observe both S1 and S5 being replaced. In Fig. 2 S1 and S5 are fully in and S2 is still growing. On most birds both wings will be symmetric in the molt. However, if a bird loses a single feather not associated with molt, that feather can be replaced at any time of year. This is called adventitious molt and complicates the interpretation of molt limits. Molt limits are not restricted to the wings. The tail is also composed of flight feathers which are replaced in specific patterns. The tail feathers are counted from the center toward the outside. The Cooper's Hawk in Fig. 3 has replaced T1, T3 and T4. T2 and T5 should be next followed by T6. The thing I like about trapping and banding raptors is the opportunity to experience these magnificent creatures on many scales. We observe the migratory timing on the population scale, the molt strategies on a family scale, the hunting strategies on a species scale, and the body condition on an individual scale among many other things. Every day I spend on the mountain I come away more in awe about these predators and grateful that I have focused my career on their preservation. We catch a lot of Sharp-shinned Hawks and Cooper's Hawks, but also many other species. So far I've trapped seven Red-tailed Hawks this year including my first dark morph (color morphs are a whole other issue). Here's two different juvenile Red-tailed Hawks. Another favorite are the Merlins. There are three subspecies that we can catch, but all of mine have been the columbarius sub-species. Pyle, P. 2008. Birding by Feather: A Molt Primer. Birding. 18w1-18w6. You said, "Every day I spend on the mountain I come away more in awe about these predators and grateful that I have focused my career on their preservation." If I could turn the clock back, instead of getting a degree in business and making decent money ( I was able to retire early), I would get a degree that would allow me to do what you do. I would gladly give up every penny I have to have those years back and work in science with raptors and the outdoors and nature. Lucky you. I envy you. I did raptor counts at Hawk Mountain for years and now I do the raptor counts at Curry Hammock State Park in Florida, the world's best migratory funnel for Peregrine Falcons.